Antonio Brown finds himself in the headlines again. And again, not for a great reason. 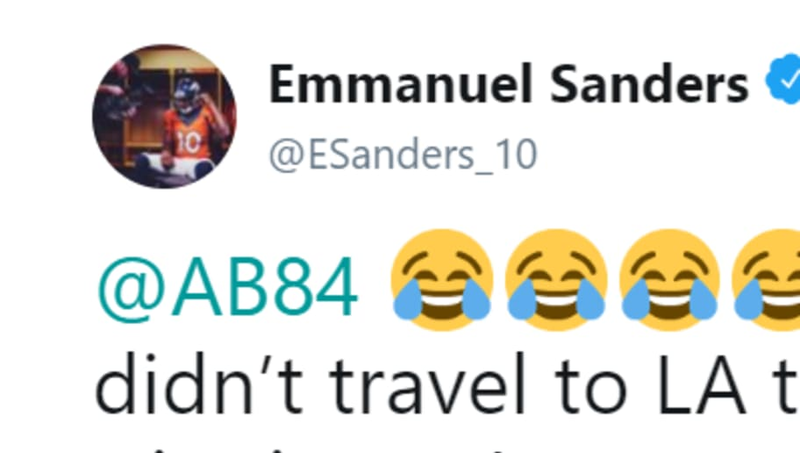 Denver Broncos wide receiver Emmanuel Sanders has clapped back at Brown after the (for now) Steelers receiver took a shot at him on Twitter. The beef started with Tampa Bay head coach Bruce Arians calling Brown a diva. Brown then took a shot at Sanders in the process. He said that Sanders went out of his way to trash talk him. Sanders was not going to let Brown get away with criticizing him. Sanders scolds Brown for acting "foolish" and tells him that he deserves all the negative light he has been getting. Sanders is right. Brown needs to chill. He's not helping his case in any possible trade deals by acting this way so publicly. All the headlines of Brown's diva attitude are distracting from real, positive news. This includes the fact that Ryan Shazier, his Steelers teammate, is trying to play football again. He sustained a serious spinal injury, but he has not given up. He's now walking and working out, hoping to complete an incredible comeback. Unfortunately, no one is talking about him as much as they should because of guys like Brown. We hope his shenanigans will end soon. Will they, though? Doubtful.